The Methodist Conference has responded to the latest debate about Nestlé's marketing of baby milk by adopting a text with the reminder that, "Methodist members may, through conscience, wish to maintain a consumer boycott of [Nestlé] products." 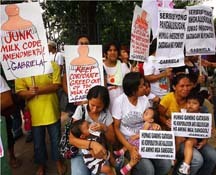 Baby Milk Action welcomes this reminder and invites Church Members to support its campaign of solidarity with mothers in the Philippines (left) who are currently trying to stop Nestlé from weakening marketing regulations successfully defended a few years ago. Calls at Conference for a review of a decision by the Church's Central Finance Board to invest in Nestlé were rejected as the Church's Joint Advisory Committee on the Ethics in Investment (JACEI) responded to a Memorial by claiming it was "regrettable" that violations of marketing requirements in a large company "may persist". No reference was made in the JACEI response and its brief report to Conference of recent evidence from expert bodies of systematic and widespread violations by Nestlé. Baby Milk Action documented some of the omissions from the JACEI report in a press release prior to the Conference - see press release 3 July 2013. 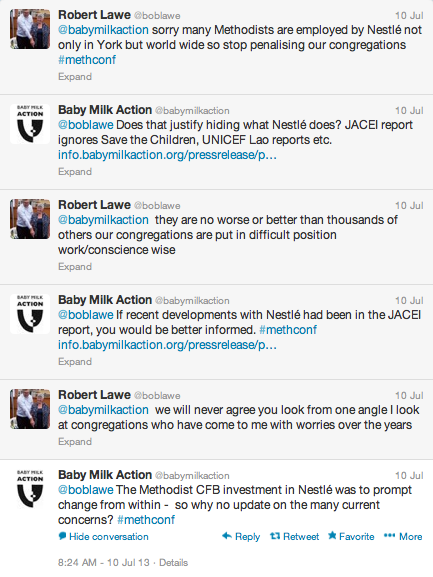 A Methodist Church Officer tweeted to Baby Milk Action from the Conference that many Methodists are employed by Nestlé, "so stop penalising our congregations". In 2006 the Conference directed the Joint Advisory Committee for the Ethics of Investment to report to the Conference on the outcomes of meetings with senior executives of Nestlé and to introduce a mechanism to monitor annually Nestlé’s ethical performance. "Regrettably across a large international company such as Nestlé, specific instances of violations of the International Code may persist. In addition there remains a lack of consensus on interpretation of certain aspects of the International Code. Although instances of the most serious violations have reduced over the past two decades, some Methodist members may, through conscience, wish to maintain a consumer boycott of products." 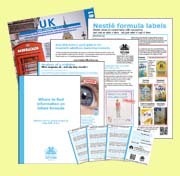 The International Code of Marketing of Breastmilk Substitutes was adopted by the World Health Assmebly in 1981. Subsequent Resolutions adopted by the Assembly address questions of interpretation and new marketing strategies and scientific knowledge. In line with Article 11.1 of the International Code, UNICEF's Legal Officer has also provided clarifications on intepretation, which have been rejected by Nestlé. The CFB investment has been presented as part of a process of "engagement" with Nestlé executives to address "ethical concerns across a range of issues" and as "complementary" to the boycott. However, in practice it has been used by some to suggest there are no longer concerns with Nestlé's business practices. For further information on the recent evidence of Nestlé malpractice missing from the JACEI response to the Memorial and report to Conference, click here.